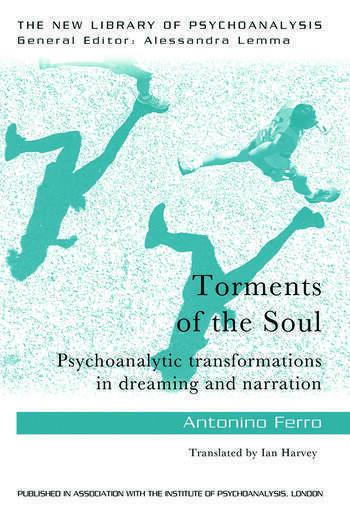 In Torments of the Soul, Antonino Ferro revisits and expands on a theme that has long been at the heart of his work: the study of dreams during sleep and in the waking state, and the psychoanalytic narrative. Following Bion, he focuses on the importance of what he sees as the task of contemporary psychoanalysis for generating, containing and transforming previously unmanageable emotions with a clinical psychoanalytic context. Antonino Ferro explores the concepts of 'transformations in dreaming', the session as a dream, individuals transformed into characters, the interpretation of these characters, and readings of them as the functioning of a single mind or as an analytic field created by the meeting of two minds: the client's and the analyst's. Here, a new identity, the analytic field, is formed from the reverie of both participants, which makes it possible to work on complex, nonlinear phenomena in a radical way, creating a 'royal road' to the unconscious communication of the patient. Torments of the Soul contains a plethora of clinical vignettes from the author's extensive psychoanalytic work with adults and children to illustrate the substantial theoretical progression he advocates here. Offering significant and important new interpretations of theories and ways of working with patients, this book will be essential reading for psychoanalysts, psychotherapists, psychologists, students of these fields and those interested in the human sciences. The Torments of the Soul. Grasping and Casting. Looking Around and Going to the Cinema. In Praise of Interruption and of Apparent Stupidity. Therapeutic Action and Characters of the Field. Casting and Mental Suffering. Who Has Seen it? Stories of Life, Stories of Analysis, Publication and Transmission of Psychoanalysis. Clinical Implications of Bion’s Thinking. Psychoanalytical Exercises and Games. Antonino Ferro is President of the Italian Psychoanalytic Society and also Consultant Associate Editor of the International Journal of Psychoanalysis. He is a training and supervising analyst in the Italian Psychoanalytic Society, the American Psychoanalytic Association and the International Psychoanalytical Association. He has been a visiting professor of psychoanalysis in various institutions in Europe, North America, South America and Australia. He received the Sigourney Award in 2007.